More than 200 students and workers gathered Friday afternoon in support of the dining workers’ union, UNITE HERE Local 26, which is in negotiations for a contract with the university administration. Speakers at the rally called for shorter working hours, affordable health care, job security and fair treatment in the workplace. Demonstrators included students, dining workers, teaching faculty and union representatives. According to Tufts Dining Action Coalition’s (TDAC) Facebook event, the rally was organized due to a feeling that negotiations over the contract were moving too slowly and that the administration was not willing to guarantee basic items. Negotiations between the union bargaining committee and the administration began in August, four months after the workers voted to unionize. Since then, there have been seven meetings totaling nearly 30 hours of bargaining, according to Trisha O’Brien, who identified herself as the union negotiator, and Jesse Ryan, a sophomore and organizer for TDAC. After being addressed briefly by Edwin Jain, a senior and organizer for TDAC, the crowd began marching north on Latin Way toward Ballou Hall. The demonstrators turned west on Professors Row before turning north again on Packard Avenue. Tufts University Police Department blocked traffic at intersections while marchers passed through. The march ended in front of the north entrance of Ballou Hall. The path and structure of the march were reflective of a rally that occurred on Apr. 3 in support of the dining workers’ unionization. According to TDAC member Andrew Jefferies, however, Friday’s rally served a different purpose. According to Ryan, the rally in April was mostly led by student organizers, while dining workers planned and led Friday’s rally. “[At] last year’s rally, we had 10 to 15 workers there, but this year, there [are] going to be 90 to 100 workers,” Ryan said in an interview before the rally. O’Brien said workers played a larger role this time because they were more confident after the 127–19 vote in favor of unionization on Apr. 24. She also noted that workers feared retaliation from managers and bosses if they publicly supported the organization effort in April. 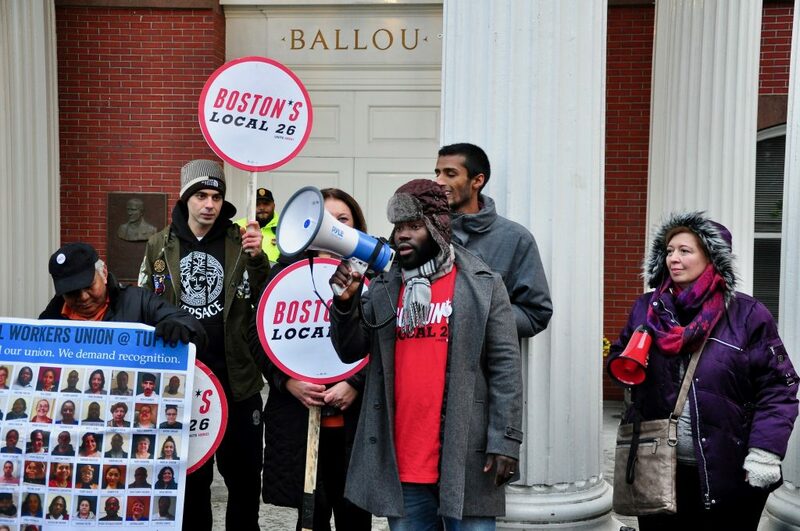 In front of Ballou Hall, a lineup of speakers that included workers, students and faculty addressed the crowd. They listed the dining workers’ demands such as shorter working hours, affordable health care, and giving full-time benefits to temporary workers. In an interview with the Daily after the rally, Vincenza Navarra, a dining worker, said that working long shifts strains her family. Navarra explained that the union is pushing the administration to shorten work schedules to avoid such strain. During the rally, workers said that they experience harassment and verbal abuse from managers, which has had a negative impact on the working environment. O’Brien said that the working conditions differ greatly from when she joined Tufts Dining Services 30 years ago. According to O’Brien, the change is attributed to the conduct of the Dining Services managers and to understaffing, which has led to longer working hours and a strenuous working environment. She said that Dining Services has not done enough to address the issue since she and other workers raised the issue with Dining Services management, as well as the university administration. “In the past five or six years, they don’t care about staffing. We are so understaffed — it’s ridiculous,” O’Brien said in an interview. Another issue raised by the demonstrators was the status of temporary workers. Temporary workers are not considered full-time staff and do not receive benefits like health care, vacation days and personal days, according to O’Brien. She said that there are over 40 temporary workers employed by Dining Services, some of whom have worked for Dining Services for more than a decade. Tina Lavanga, a worker at Hotung Café, addressed the crowd on behalf of temporary workers. According to Lavanga, some temporary workers work 40 or more hours per week. She said that she began working for Tufts Dining eight years ago and that she enjoys its friendly atmosphere but that she needs to have job security. Lavanga explained that every August, she waits for a letter to come in the mail that invites her to return to work. Lavanga said that because temporary workers do the same work as permanent employees, they should receive the same benefits and treatment. Policies regarding temporary workers affect a large fraction of the dining staff. Between one-fourth and one-third of dining workers have temporary working status, according to Mike Kramer, a union representative. First-year student Fiona Davis-Walsh said she attended the rally to push the university to adopt a fair contract. Rabbi Jordan Braunig, director of the Initiative for Innovative Community Building at the Granoff Family Hillel Center and part-time lecturer in Judaic Studies, addressed the crowd on behalf of Tufts’ faculty. He said supporting the dining workers’ union was a way to encourage community at Tufts. To Grazia DiFabio, a dining worker, a fair union contract means holding managers accountable and ensuring higher wages and shorter working hours. Tufts’ Executive Director of Public Relations Patrick Collins told the Daily in an email that progress is being made during union negotiations. Correction: A previous version of this article inaccurately represented the number of people at a Nov. 16 rally to support dining workers’ unionization efforts as over 100. More than 200 people were present at the rally. The article has been updated to reflect this change. The Daily regrets this error.